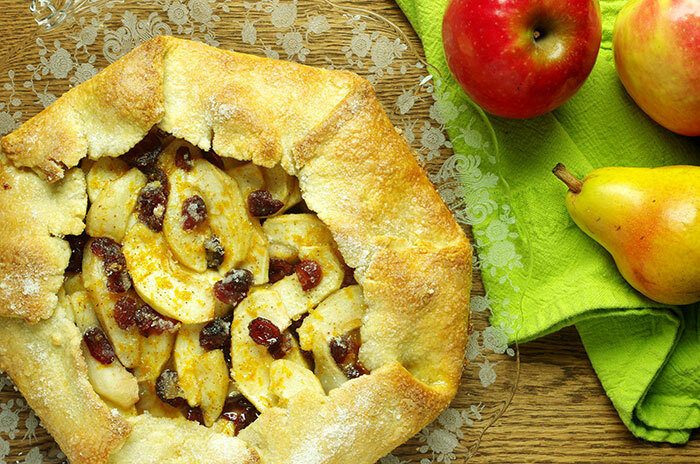 I love the rustic look of this tart filled with sliced apples, pears, and cranberries. Rather than baking it in a pie plate, you simply roll out the crust into a circle, fill it with fruit, and fold the sides up around the filling. It’s sweet and tangy, doesn’t require any fussiness on your part, and makes an impressive Thanksgiving centerpiece. It’s best served with vanilla ice cream. APPLE NOTES: Any firm-tart apple variety will work very well here. 1. 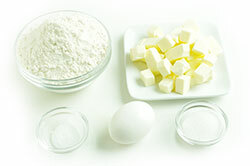 First, make the crust: In a medium bowl, whisk together the flour, salt, and sugar until well combined. Sprinkle the butter cubes on top and use your fingers to work them in (you want to rub your thumb against your fingertips, smearing the butter as you do). Stop when the mixture looks like cornmeal with some pea-sized bits of butter remaining (try to work quickly so the butter doesn’t melt). Sprinkle the egg yolk-water mixture on top and stir with a fork until the dough begins to come together. If needed, add one more tablespoon of water. 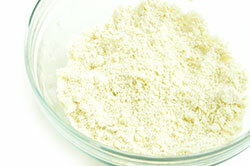 Turn the dough out onto a lightly floured surface and knead three times. Gather into a ball, then press into a disk and wrap in plastic wrap. Refrigerate for at least 30 minutes. 2. Meanwhile, preheat the oven to 400° F and set a rack to the second-from-the-bottom position. 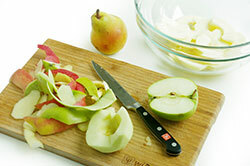 Peel, core, and cut the apples into 1/4-inch-thick wedges. Peel and cut the pear into 1/2-inch-thick slices. Gently toss together in a bowl and set aside. In a small bowl, combine 1/2 cup sugar, the cornstarch, orange zest, and cloves; set aside. 3. 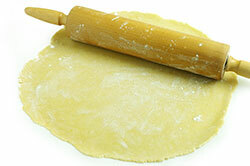 On a lightly floured surface, roll the dough into a circle about 16 inches wide and 1/8 inch thick. The circle doesn’t have to be perfect – this is a rustic dessert – but try to get it as round as possible, even if that means cutting little dough off one side to add to the other. Transfer the dough to a baking sheet lined with parchment paper. 4. 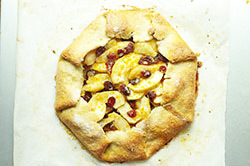 Arrange half the apple and pear slice over the dough, leaving a 2-1/2-inch border all around. 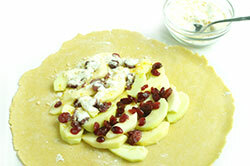 Sprinkle half the cranberries over the apples. 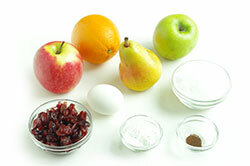 Sprinkle half the sugar-cornstarch mixture over the fruit, then repeat with the fruit and then the sugar mixture. Fold the sides of the dough up and over the edge of the filling, allowing the dough to drape over itself at each fold. Brush the dough with the beaten egg, and sprinkle all with one teaspoon of sugar, Bake for 10 minutes; lower the temperature to 375° F, and bake until golden brown, about 25 minutes more. Let cool on a rack for at least 30 minutes, then transfer to a serving platter and serve warm. Recipes from The Apple Lover’s Cookbook by Amy Traverso. Published W. W. Norton & Company, Inc., New York, NY. Copyright 2011. Reprinted with permission of the publisher. All rights reserved.